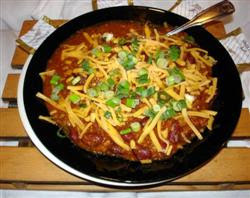 Thanks to Heidi for giving me this great recipe from the Weight Watcher's Pantry to Plate cookbook. We loved it! 1. Cook rice. Preheat oven to 400 F. Bake squash, cut side down until tender (30 min). Cool for 10 min. & scoop out the pulp, leaving 1/4" thick shells. 2. While the squash is cooking, brown turkey in a skillet. Add veggies and cook until tender. Stir in cinnamon, salt, pepper & garlic & cook a minute longer. 3. Add chives & squash to veggie/meat mixture. Fill squash shells & cook for 10 minutes. Sprinkle with pine nuts before serving. 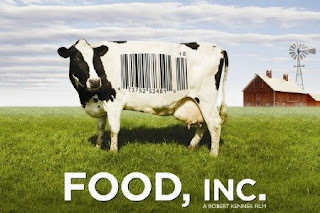 I watched Food, INC. last night with my husband. If you know me, you know that I am already very concerned with what my family eats & try my best to feed them healthy meals. I may post a lot of sugary & fattening recipes, but in actuality, I rarely make food like that. This movie just fanned the flame of my slightly granola-ish hippy eating habits. I seriously was dreaming about inhumane chicken coops last night! The condition of our nation's food industry really concerns me. More and more people are developing life-altering diseases like diabetes. And the more "advanced" our society gets in the technological world, the lazier we as a people become as we spend increasing amounts of time in front of electronic gadgetry. Childhood obesity is rampant! I don't know about you, but when I was young there were one (maybe two) fat kids in my grade school class. Now I walk into a school & I swear that half of the children are overweight! The cost of insurance & health care is going through the roof & I believe it's because our "healthy habits" are going down the toilet. Here are a few ways you can change the way the system works. Make your own meals & use as little processed foods as possible, try to buy organic when possible, buy locally grown produce & free range meats. It may cost a little more, but do you really want to be putting ammonia treated beef, arsenic laced turkey, and ethylene ripened tomatoes into your body? Supply & demand! If we refuse to buy unhealthy food & opt for only nutritious food, then grocery stores & food companies have no choice but to provide consumers with what they want. If you haven't seen this documentary I urge you to take 90 minutes and watch it, maybe while you're walking on your treadmill to counteract the "laziness" factor of movie watching ;). I thought that I knew a lot about where the food we get comes from, but I learned a lot! After watching the movie, I felt a little overwhelmed. After all, I am just one person in a country of 310 million people. How could I possibly solve this HUGE problem? But I realized that it has to start with me...and hopefully with you too. And finally, my personal favorite turkey leftover recipe. 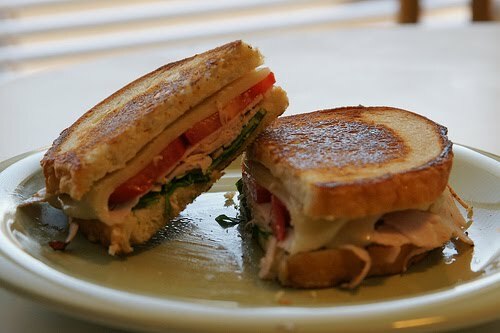 Spread pesto on bread & layer cheese, turkey & tomato. Drizzle with olive oil & cook over medium heat until cheese has melted. I found this recipe on the Food Network's site. Can't wait to try it! In a large bowl combine leftover turkey and salsa. To construct quesadilla, place one tortilla on work surface and spread with half the mashed sweet potato. Then add half the turkey mixture and half the cheese. Top with tortilla and brush with a bit of canola oil. In a large skillet over medium high heat add quesadilla oil side down then brush the top with oil. Cook for about 3 minutes until bottom begins to brown and cheese starts to melt. Flip and repeat. In a small bowl combine mayonnaise, sour cream, lime juice, chipotle, cumin, and cilantro, and season with salt and pepper. Remove quesadilla from pan, cut into wedges and serve with chipotle dipping sauce. Garnish with green onions. In a large skillet coated with cooking spray, cook the onions and green pepper over medium heat until tender. Add garlic; cook 1 minute longer; Drain. Sprinkle with chili powder and salt. Stir in the turkey, beans, tomatoes, water, rice and olives. Transfer to a 2-1/2-qt. baking dish coated with cooking spray. 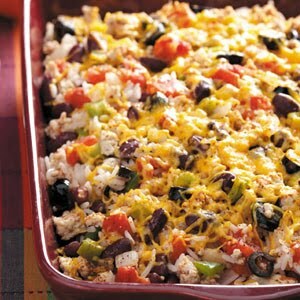 Cover and bake at 375° for 50-55 minutes or until rice is tender. Uncover; sprinkle with cheese. Bake 5 minutes longer or until cheese is melted. Yield: 6 servings. 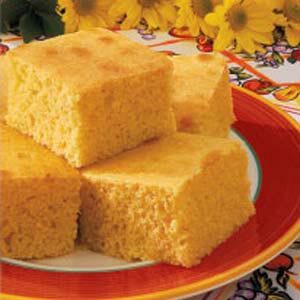 Here's some yummy corn bread to go with your chili. This is seriously the best corn bread I have ever made! In a large bowl, cream butter and sugar until light and fluffy. Combine the eggs and milk. Combine the flour, cornmeal, baking powder and salt; add to creamed mixture alternately with egg mixture. Pour into a greased 13-in. x 9-in. baking pan. Bake at 400° for 22-27 minutes or until a toothpick inserted near the center comes out clean. This is another America's Test Kitchen favorite. So easy & perfect for a cold snowy day like today! 1. Over medium heat, cook onion & bell pepper in oil with spices until tender. Add garlic for 30 seconds. Remove to crock pot. 2. Brown ground beef & add to crock pot with beans, tomatoes & tomato sauce. 3. Cook on low for 6-7 hrs. or on high for 3-4 hrs. Serve with shredded cheese & sliced green onions.